During street improvements on N Going Street travel will be reduced to one lane eastbound and westbound. Message boards, traffic signs and flaggers will direct traffic during construction. (Nov. 8, 2018) The City of Portland Bureau of Transportation advises the traveling public that street improvements on N Going Street from the I-5 North Exit 303 to N Interstate Ave will require lane closures beginning Friday, November 9 through Sunday, November 11, during all hours and all days. The lane closures will allow crews to grind and pave the street as part of the Fixing Our Streets Program. This particular project is funded by the Heavy Vehicle Use Tax. As part of the paving work, N Going Street will be reduced to one lane in each direction during all hours and all days for the duration of the project. Additionally, the I-5 northbound Exit 303 off ramp will be closed starting at 11:00 p.m. on Friday, November 9 through 4:00 a.m. on Monday, November 12. Eastbound traffic on N Going Street, as well as northbound and southbound traffic on N Interstate, should follow the signed detours to I-5. 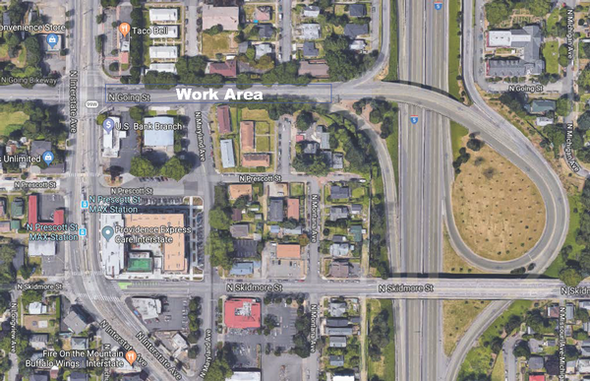 Eastbound traffic on N Going will may use the N Greeley Street offramp from N Going St. north to N Killingsworth to access I-5 southbound or can use N Interstate Ave to N Alberta to access I-5. People driving north on N Interstate can access I-5 by following detour signage to N Alberta Street. People driving south on N Interstate can access I-5 either at Alberta or by proceeding south to the Steel Bridge interchange at the Rose Quarter.